The 2019 NCAA women’s basketball tournament is ready to start Friday, March 22, with 16 First Round games. 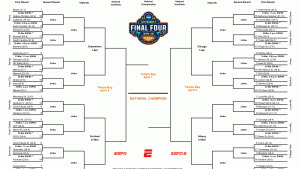 Below, you will find the bracket, schedule and TV channel information. The 64-team bracket is headlined by Baylor, Notre Dame, Louisville and Mississippi State as No. 1 seeds. For the first time since 2006, UConn is not a top seed, as the Huskies are a No. 2 in Louisville’s region. How are NCAA women’s basketball tournament teams selected? There are 64 teams in the single-elimination tournament. Of those, 32 qualify automatically as conference champions by winning conference tournaments. The rest will be selected as at-large teams by the Division I Women’s Basketball Championship Sport Committee. Earlier this season, the committee twice announced its top-16 teams: Feb. 11 and March 4. However, these reveals have no bearing on the final 64-team field. In the March 4 reveal, Baylor, Louisville, Notre Dame and UConn were No. 1 seeds. When the bracket was revealed, Baylor, Louisville, Notre Dame and Mississippi State received No. 1 seeds. UConn dropped to a No. 2 seed. The Field broken up by the top 5️⃣ Conferences.